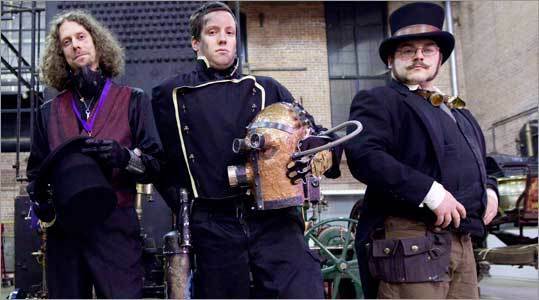 (Globe photo / Yoon S. Byun) From left: David Burbank, Mike Kaharek, and Luke Alencikas of Steam & Cinders, a Boston-based Steampunk-themed group. When Bruce and Melanie Rosenbaum bought a 1901 home in Sharon, they wanted to restore it top to bottom. And rather than force a modern interior design, they remodeled it with a Victorian twist. In the kitchen, an antique cash register holds dog treats. A cast iron stove is retrofitted with a Miele cooktop and electric ovens. In the family room, a wooden mantle frames a sleek flat-screen TV, and hidden behind an enameled fireplace insert, salvaged from a Kansas City train station, glow LED lights from the home-entertainment system. Unknowingly, the Rosenbaums had “steampunked’’ their home, that is, added anachronistic (and sometimes nonfunctioning) machinery like old gears, gauges, and other accoutrements that evoke the design principles of Victorian England and the Industrial Revolution. It’s not just the Rosenbaums cobbling together computer workstations from vintage cameras and manual typewriters. Local enthusiasts are mounting steampunk exhibits, writing books, creating objets d’art, and dressing up in steampunk garb for live-action role playing games. To be sure, steampunk has been part of the cultural conversation for the past several years, as DIY-ers embraced the hand-wrought, Steam Age aesthetic over high-tech gloss. But recently, it seems to be gaining a wider appeal, especially here. Both a pop culture genre and an artistic movement, steampunk has its roots in 19th- and early-20th-century science fiction like Jules Verne’s “20,000 Leagues Under the Sea’’ and H.G. Wells’s “The Time Machine.’’ Its fans reimagine the Industrial Revolution mashed-up with modern technologies, such as the computer, as Victorians might have made them. Dressing the part calls for corsets and lace-up boots for women, top hats and frock coats for men. Accessories include goggles, leather aviator caps, and the occasional ray gun. And there’s a hint of Sid Vicious and Mad Max in there, too. Still, steampunk defies easy categorization. It can be something to watch, listen to, wear, build, or read, but it’s also a set of loose principles. Steampunk attracts not only those who dream of alternative history, but those who would revive the craft and manners of a material culture that was built to last. The urge to rescue and repurpose forgotten things led the Rosenbaums to spread the steampunk gospel. They’ve founded two companies: Steampuffin and ModVic, which infuse and rework 19th-century objects and homes with modern technology. They’re working on a book about the history of steampunk design. And, hoping some steampunker might want to live in a pimped-out Victorian crib, they purchased a second home in North Attleboro, restored it using their “back home to the future’’ philosophy, and put it on the market. Bruce is also curating two steampunk exhibits. One will be displayed at Patriot Place’s new “20,000 Leagues’’ attraction, an “hourlong, walk-though steampunk adventure,’’ scheduled to open in December, according to creator Matt DuPlessie. Meanwhile, “Steampunk: Form and Function, an Exhibition of Innovation, Invention and Gadgetry’’ recently opened at the Charles River Museum of Industry and Innovation in Waltham, a former textile mill already filled with steam engines and belt-driven machines. “Form and Function’’ includes a juried show of steampunked objects (many by local artists) like a steam-electric hybrid motorcycle called “the Whirlygig,’’ an electric mixer powered by a miniature steam engine, and a flash drive made with brass, copper, and glass. Perhaps the most impressive piece is a rehabbed pinball machine whose guts look like Frankenstein’s lab — down to the colored fluids bubbling through vintage glass tubes. Such functional art objects tap into a nostalgia for a mechanical, not electronic, age. Unlike the wireless signals, microwaves, and motherboards of today, the 19th century’s gears, pistons, and tubes were visible and visceral. While the workings of a laptop can seem impenetrable, we can fathom the reality of moving parts. Some of the most committed local steampunkers dress up in period garb and take part in live-action role playing games. Most “LARPs’’ (think Dungeons & Dragons but in costume) are swords and sorcery-based, but Boston’s Steam & Cinders is one of only a couple of steampunk-themed LARPs anywhere. Once a month, some 100 players gather for a weekend at a 4-H camp in Ashby. The game’s premise? A crashed dirigible has stranded folks at a frontier town called Iron City, next to a mysterious mine. Engineers, grenadiers, and aristocrats vie for supremacy. There are plenty of robots to fight (players dressed in cardboard costumes sprayed with metallic paint), and potions to mix (appealing to the mad scientist in us all). Players stay in character for 36 hours straight. Meanwhile, publishers are striking while the steampunk iron is hot. Climb to Bruce Rosenbaum’s third-floor study and you feel as if you’ve entered one of those mash-ups. The attic space feels like a submersible, packed with portholes, nautical compasses, and a bank vault door. His desk is ornate and phantasmagorical, ringed with pipes from a pipe organ. It’s a place where you can imagine Captain Nemo banging out an ominous dirge. Ethan Gilsdorf is the author of “Fantasy Freaks and Gaming Geeks: An Epic Quest for Reality Among Role Players, Online Gamers, and Other Dwellers of Imaginary Realms,’’ now in paperback. He can be reached at ethangilsdorf.com.